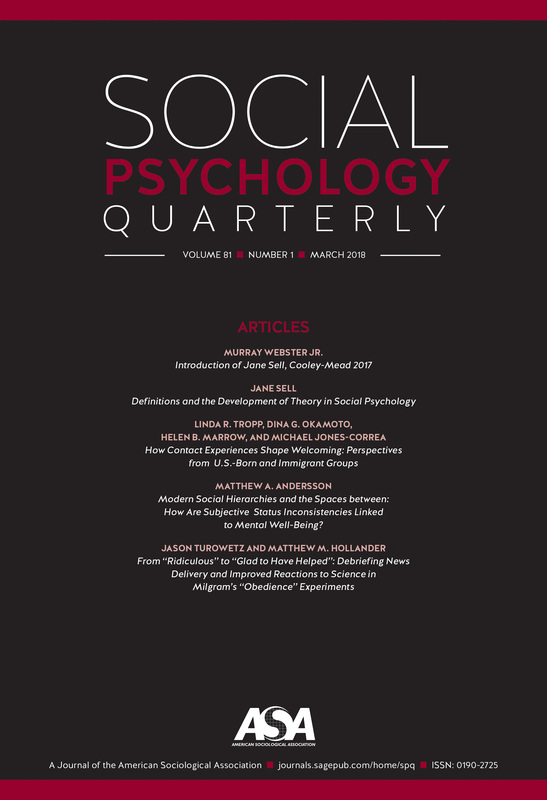 Social network analysis has been a central topic for Social Psychology Quarterly since the journal was still Sociometry when it aspired to focus on studying inter-personal relations. This special issue calls for papers that re-visit this root of social network analysis by studying the social psychological foundations of social networks and the interplay between social networks and social psychological processes. We expect the new research to advance both social network analysis and sociological social psychology in substantive or methodological terms. Selected topics include but are not limited to the following. Full papers should be submitted at http://mc.manuscriptcentral.com/spq by June 1, 2019. See "Notice for Contributors" for the submission requirements. Please indicate in a cover letter that the paper is submitted for the special issue on “Social Networks and Social Psychology." For more information on the special issue, please feel free to contact the SPQ Co-Editor Brent Simpson (bts@mailbox.sc.edu) or the special issue editors Weihua An (weihua.an@emory.edu), Matthew E. Brashears (brasheam@mailbox.sc.edu), and Cathryn Johnson (cjohns@emory.edu).